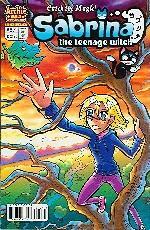 If you know Sabrina, the teenage witch, from the old situation comedy on television (the one with the obviously mechanical talking cat), you don't know Sab-rina, the comic book. She's manga now. For the uninitiated, manga is comics, Japanese style, i.e. story and characterization reflecting Japanese culture and art featuring very large eyes, small bodies, and a minimum of visual details. Wow. That"s not something normally associated with Archie comic books. Also unlike TV"s Sab-rina, this one mostly lives in a fantasy dimension parallel to ours, has joined a "movement" in rebellion to its Queen, and struggles to save the manga tree that is the very life of their magic realm. Wow again. That's not very Archie either. To top it off, comics for very young girls are rarer than hen's teeth. Here's one. For most women, relationships with other people are a high priority in life. It's certainly true for Sabrina the comic book, and I'm thrilled. What's that, sissy boy? Yep. I'm thrilled to see a well-written comic book attracting anyone new to comics, and particularly thrilled that Sab-rina does so. Why? Her world is one of unabashed morality and high ideals, of love and compassion and courage. There needs to be more of this in a comics field cluttered with cynical and hackneyed violence, selfishness, and nihilism. All this positive affirmation is from a guy who doesn't particularly like manga, and is too old to be reading comics written for very young girls! What are you, Mr. Reviewer, on some moral crusade? Yep. I'm particular.